As Chief Sustainability Advisor, Mr. Appiah reports directly to Mayor Mohammed Adjei Sowah, Accra Metropolitan Chief Executive. 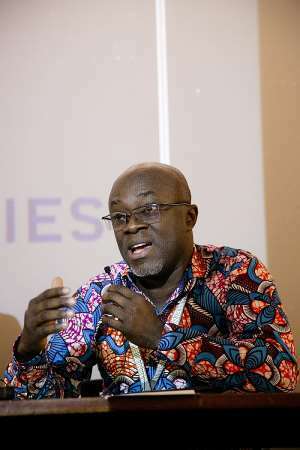 With a portfolio covering issues related to sustainability and resilience, Mr. Appiah has played an active role in the development of Accra’s first-ever, comprehensive Resilience Strategy. Financial and technical support for the resilience work comes from 100 Resilient Cities – Pioneered by The Rockefeller Foundation (100RC), an organization committed to enhancing the resilience of cities worldwide; through its membership in 100RC, the AMA additionally receives access to best practice resilience-building tools from a global platform of partners in the private, public, academic, and nonprofit sectors. “An increase in seismic activity across the Greater Accra Region in recent months has reached the level of moderate earthquake, reminding us of the threat of a serious earthquake that could follow. Water shortages, mainly attributed to aging infrastructure, stand in contrast to devastating floods experienced by the metropolitan area throughout the rainy season. The impacts from these acute and slow-burning disasters have the potential to be long-term, especially for our most vulnerable communities. “This week the Accra Metropolitan Assembly will publish its plans to anticipate and plan for unexpected events like these. With its set of actionable initiatives and concrete projects, the Accra Resilience Strategy will be a cornerstone of the AMA’s efforts to create a smart, resilient, and sustainable city which prepares its citizens and systems to withstand challenges big and small – and to grow stronger as a result. Ours will be only the second Resilience Strategy to be published in West Africa, and 100 Resilient Cities – part of a $164 million commitment by The Rockefeller Foundation to build urban resilience worldwide – offered invaluable guidance along the way. As cities continue to develop new solutions to similar challenges, it has been an important experience to learn from our peers in the 100RC global network. “For example, to minimize the impact of flooding on vulnerable communities living in high-risk areas, officials in Bangkok, Thailand, are conducting a series of impact studies to inform new flood preparedness guidelines. As a complement, the city seeks to launch a ‘Community Based Disaster Risk Management’ pilot establishing a network of community leaders that would help develop community action plans, identify and mobilize shared resources, and ensure that flood hazard guidelines are developed with the input of local communities. In a similar manner, the Accra Resilience Strategy outlines a plan to engage communities as we work to strengthen the performance of our city’s drains and design new models to decrease flooding. “Although flooding caused by excess rainfall or sea level rise is an environmental challenge, in Accra the effects are compounded by ongoing stresses such as inefficient drainage networks and waste management. Through key initiatives in the Resilience Strategy, the AMA will work with community members to strengthen drain design and performance, with the aim of reducing the amount of flooding we experience in times of heavy rainfall. Complementing this is our ongoing collaboration with the Ministry of Sanitation and Water Resources on the development of a Climate Strategy for Accra and an Integrated Urban Environmental Sanitation Strategy and Master Plan. Together this pair of initiatives hopes to clear up our city’s drains and waterways, significantly reducing the amount of flooding we experience, but also related health challenges (e.g. waterborne diseases). “This intermix of challenges and solutions drives home the fact that cities are complex systems in which a full range of sustainability issues converge. If we think of sustainability as being about putting the world into long-term balance amidst environmental constraints, then resilience is the quest for ways to make systems endure and even thrive in an imbalanced world.